FRx provides specialty injection services for delivery of treatment reagents and materials into contaminated soil and bedrock for the purpose of effecting either removal or in situ destruction of the contaminants. Every project is considered an ad hoc application of technologies that FRx has developed and practiced over the years - indeed, we are always ready to accept new challenges. While the techniques and methods that we practice have existed, in some cases, for decades, only a handful of venders can offer such services. Thus the requisite equipment and talent may not be available locally to your site. Accordingly, FRx routinely dispatches custom-built equipment and trained workers to every site. In addition to its own equipment, FRx may rent common construction equipment, such as a forklift, locally and often subcontracts drilling services from a local vender. (Engaging a local driller often ensure compliance with local laws.) FRx will oversee all drilling activities related to its work and can extend drilling activities to included sampling or well construction related to the project. FRx can purchase the remedial materials if the project needs to be conducted in a turn-key fashion. FRx records injection pressure and reports it quantities of materials used in every injection event. In addition, FRx can perform surface deformation monitoring, which provides additional data to assess fracture form. In addition to traditional surveying methods, FRx can provide real-time tiltmeter monitoring of the ground surface. 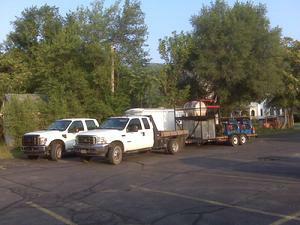 Specialized FRx equiment is mobilized in pickup trucks with trailers. Notably, FRx provides only injection services. Unlike other injection service providers, FRx does not also offer a product line of materials or a service line of well drilling. We concentrate on what we do and believe we are the best at it. FRx personnel are experts in the field of applying hydraulic fracturing technology for environmental remediation purposes. Hydraulic fracturing technologies provide the potential to significantly enhance flow conditions in the subsurface, thereby improving the effectiveness of many remedial applications. Furthermore, hydraulic fractures can be created with granular, reactive materials. These materials can be composed of chemicals, nutrients, and/or biological entities that enhance passive treatment systems.